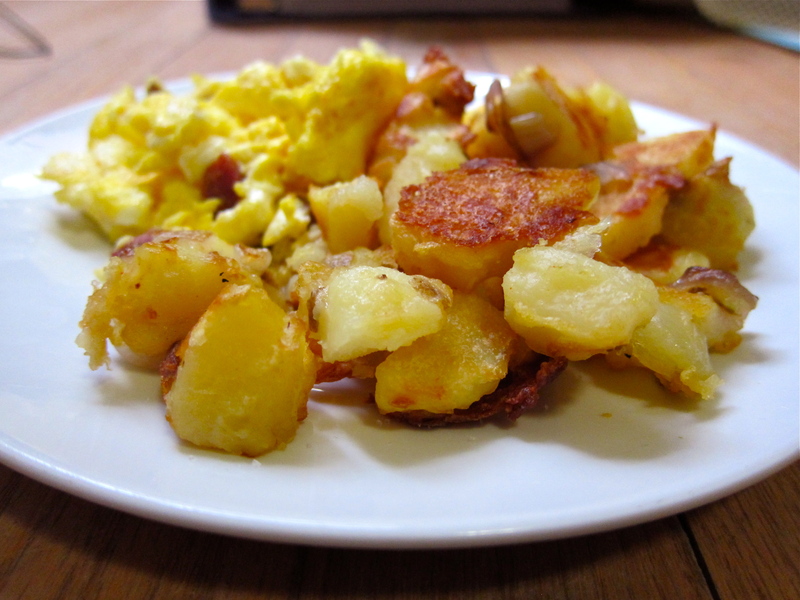 While there may seem like a lot of steps in this recipe, these scientific home fries are actually quite hands-off compared to most recipes (they take about 50 minutes to make, but most of that time is spent in the oven while you clean up the rest of the dishes and start making coffee and preparing the eggs). The gist of the recipe is to quickly precook hunks of potatoes in boiling water with a small shake of baking soda and then let them hang out in a hot oven. What’s the secret to getting that crispy, golden-brown exterior? Two things: a parboil with baking soda, and salting the exterior of the potatoes (thanks, Cook’s Illustrated/America’s Test Kitchen for doing all of the dirty work to figure this out for the rest of us). Parboil with baking soda: A short one-minute blanch in boiling water helps break down the very exterior of the potato. The baking soda (only 1/2 teaspoon per 10 cups water!) helps speed up the softening process, exaggerating the differences in doneness between the exterior and the interior of the potatoes. This helps the thin outer layer of the blown-out starchy potato brown thoroughly in the oven, while the raw middle stays soft and moist. Salting the exterior: The drained and par-cooked potato chunks get placed back in the pot and dried off over low heat. Once dryish, the heat gets shut off and the potatoes get tossed with butter, salt, and a little spice before being placed on a pre-heated baking sheet in the oven. The coarse salt roughs up the surface of the potatoes so that moisture evaporates faster, leading to better browning in the oven. 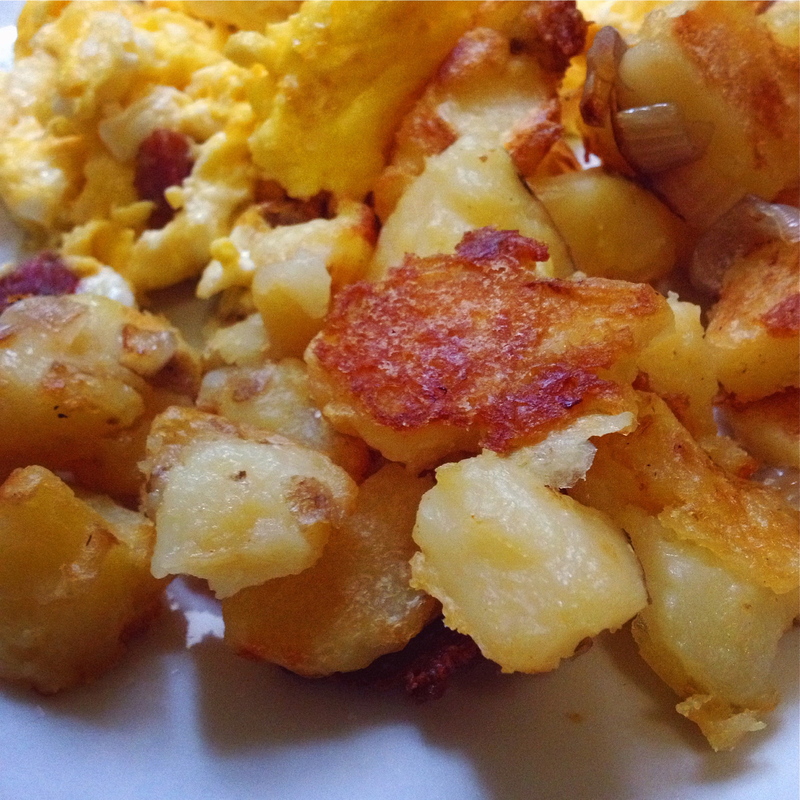 The potatoes really did form a “crust” on their outer edges. How could you not love that?! To sum, a thin outer layer of roughed up potato mush = more surfaces for golden brown exteriors! Go classic and pair these “home-roasted potatoes” with your favorite style of eggs (fried, scrambled, flipped, or poached!). Or, serve them as your starchy vegetable with dinner. 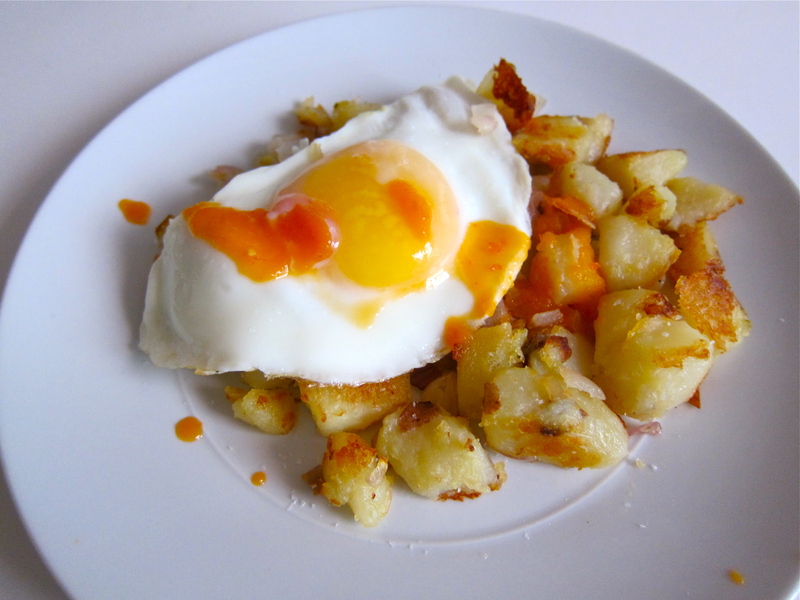 Leftover potatoes reheat well in the oven or in a pan with a little extra oil to perk them up. 1. Place a rimmed baking sheet on the middle or lower position of the oven. Heat the oven to 500 degrees F.
2. Bring 10 cups water to a boil in a large pot over high heat. Add potatoes and baking soda. Return to boil and cook for 1 minute. Drain potatoes. Return potatoes to the pot and place over low heat. Cook, shaking the pot occasionally, until any surface moisture has evaporated, about 2 minutes. Remove from heat. Add butter, 1 1/2 teaspoons salt, and smoked paprika. Mix with a rubber spatula until potatoes are coated with a thick starchy paste, about 30 seconds. 3. Remove the preheated baking sheet from the oven and drizzle with 2 tablespoons oil. Transfer potatoes to the baking sheet and spread into an even layer. Roast for 15 minutes. While the potatoes roast, combine the shallots, remaining tablespoon oil, and 1/2 teaspoon salt in a bowl. 4. Remove baking sheet from the oven. Using a spatula, scrape and turn the potatoes. Clear about an 8 by 5-inch space in the center of the baking sheet and add the shallot mixture. Roast for another 15 minutes. 5. Scrape and turn again, mixing the onions into the potatoes. Continue to roast until the potatoes are well-browned and the onions are softened and beginning to brown, 5 to 10 minutes longer. Stir in the chives, if using, and season with salt and pepper to taste.